"Mom, could you push my button?" Oh yah, I can push your buttons. Yesterday Gunnar and I ran to the grocery store. 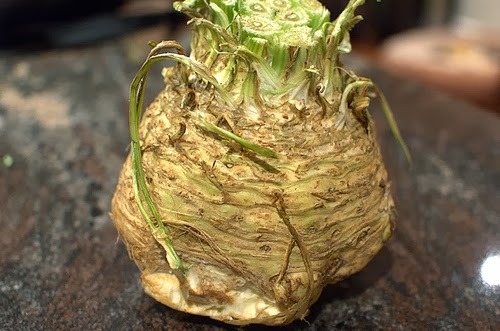 In the produce section he noticed something he'd never seen before - a huge celery root, like this one but more wrinkly. "Mom, you know what that reminds me of?" And it did look like Grandpa Simpson, it really, really did. So funny- I see it too! You, ma'am, are having a silly Wednesday. but....I must be slow today, what am I supposed to be seeing??? Mom - the celery root (well, the one at the grocery store even more so) looks a lot like Grandpa Simpson's head. Too bad I don't take my camera to the store! Yes, I needed that chuckle to start my Thursday. Thank you!